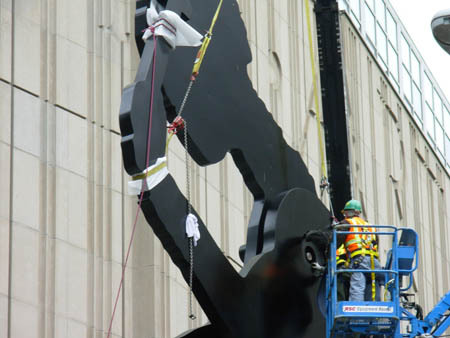 Hammering Man went into surgery without incident this morning. The docs are hard at work , performing the delicate operation to reattach his errant arm. Despite the wind, prognosis is good, and it seems he may be re-armed and back in the swing by later this afternoon. We’ll be here in the waiting room (AKA, the SAM development department windows), and will keep you all posted on the Man’s progress. Meanwhile, we’re completely out of fresh puns for this one and could use your help. Let us know what you can come up with.